Casting of a plaster cornice in our workshop to match the client's existing period mouldingsWilliam Wilson Architectural Mouldings Ltd do not use or stock any machine made mouldings or use any form of mechanical casting. 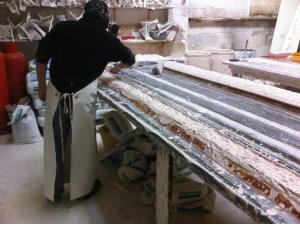 All of our plaster cornices, coving, centrepieces and other plaster mouldings are hand made by skilled craftsmen in our Workshop. With over 20 years experience with decorative mouldings, we believe in a quality product, finished to the highest standard. We use finest British Gypsum Plaster and in-house created silicone rubber moulds to produce crisp lines which enhance the detail of the finished plaster. These give a better finish than inferior fibreglass moulds, which can lose detail with each casting. To ensure longevity, all plasterwork is strengthened using hessian (scrim) and / or lathes. Each installation is treated as individual, with Bespoke Plaster Mouldings designed to suit your property and taste. We are specialists in Plaster Moulding Restoration work and as everything is produced by hand, we can match any period or style, no matter how ornate. Over the years we have worked on everything from adding contemporary styling to a new build property to renovation work on Grade 1 listed buildings, such as Stonyhurst College in Lancashire. 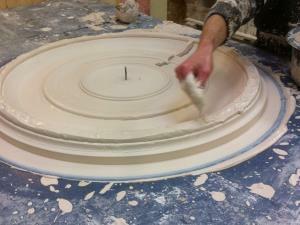 For examples of our Handcrafted Plaster Mouldings work, please take a look at the Photo Gallery page. We can supply, fit and restore handcrafted plaster mouldings to homes, businesses and historic buildings in: Accrington, Barrow, Blackburn, Blackpool, Bolton, Burnley, Bury, Carlisle, Chester, Chorley, Cumbria, Fleetwood, Garstang, Kendal, Lancaster, Leyland, Lytham St Annes, Morecambe, Oldham, Poulton-le-Fylde, Preston, Skelmersdale, Southport, Thornton-Cleveleys, Ulverston, Warrington, Widnes, Wigan, Wilmslow, Windermere, Wirral, and more!